Sacred Shrines or Messy Churches? So many of the Bible’s stories remind us that, since the fall, we have gotten “caught up” in places; Holy Lands, Holy Mountains, Holy Sites, Holy Buildings. To these places, we get attached in a way that often overtakes the original reason that the place itself was important. For instance, even the disciples, who spent all of there time on the move with Jesus traveling from place to place and who never stayed long anywhere, were tempted to try to make a location Holy with a shrine. Remember the story of Peter, James, and John, when they saw Jesus transfigured on an unnamed mountain. In Mark 9:5 after seeing Jesus transfigured before them “Peter said to Jesus, “Rabbi, it is good for us to be here; let us make three dwellings, one for you, one for Moses, and one for Elijah.”” This shows us that even Peter couldn’t resist the urge to want to build a shrine on that mountain side. We get attached to places and buildings where special events happen and we often try to preserve/honour or even freeze in time that special and important event or encounter with God by building a shrine. Take the Temple of Jerusalem for instance. The building of the first temple was an important sign for the people that God had made true on his promises to Abraham and Moses and delivered them to a land of their own where they built the temple. In Jesus day, the temple was in fact the third one which had been rebuilt by Herod, over the second, not long before Jesus’ Birth. It is important to note that Jesus spent most of his time outside the temple and Jerusalem, preaching against the Scribes and Pharisees who taught that the Temple and that temple ritual was absolutely central to the Jewish faith and their relationship with God. Jesus’ message removed the temple from its place in the relationship between God and God’s people. This is what made him such a marked man among the religious authorities. Our Gospel passage today reads, As he came out of the temple, one of his disciples said to him, “Look, Teacher, what large stones and what large buildings!” Then Jesus asked him, “Do you see these great buildings? Not one stone will be left here upon another; all will be thrown down.”” (Mark 13:1-2) In our gospel passage today, when Jesus seems to be predicting the destruction, yet again, of the grand and glorious Temple, Jesus is more truly pointing out that the New Covenant, the new relationship that he has come to invite us into with God, that this teaching itself removes completely the importance of this glorious building. The building of the temple in Jerusalem was a culmination of hundreds of years of struggle and growth for a community who were constantly working out their relationship of faith with God. But once the temple became the center of all they did they began to lose their true center, their relationship with God. God loves people, not buildings. You see, it does not matter to God or Jesus if we meet in a church or in a pub, or a home, or on the street or anywhere else. It is more important to be the community of God in our actions. It is not where we worship, but that we worship. Even then if what we all we do is worship, if we just speak the words or only pray the prayers, and that worship, those prayers, and those words don’t actually touch us and change us, or guide our actions in everything else we do during the week, then we are missing the point of Jesus’ message. Meeting God and Jesus doesn’t happen in a church, it happens in our hearts! What we do in this physical place is only important if it lead us to go out by word and example to introduce it to others. 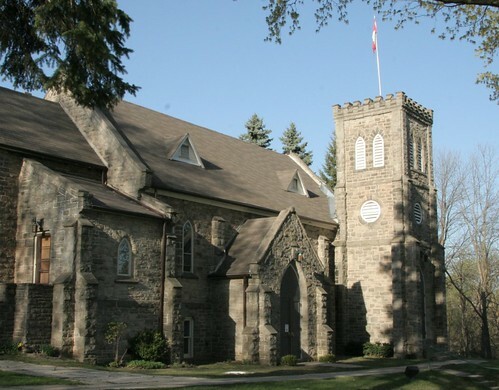 Don’t get me wrong, I love this pile of stones, we call St. George’s. But as far as our mission as the church, every effort and dollar that we spend on this physical building needs to be held up against that “new relationship” that Jesus called us into. If we are building up our facilities for their own sake our for the sake of what this place once meant to us or for the sake of those that were once here, then we have most seriously gotten off track! Jesus calls us to preserve his message, not the building we built in his name. Jesus taught his disciples to go out and tell others about this new relationship that was available for them. Jesus makes this clear in the commissioning he gives his disciples in the final chapter of Mark Gospel. In chapter 16 verse 15, the resurrected Jesus instructs his disciples to “Go into all the world and proclaim the good news to the whole creation.” For you and I today that remains the mission as the church. I want to highlight for you today about one of the great ways that St. George’s is proclaiming the Good News and introducing people in our community to the message that Jesus has offered each of us a new relationship with God. Messy Church. The reason I highlight it today is twofold. First, it is very clearly the results of us as followers of Jesus establishing relationships with those who wish to be introduced to the message of Jesus and second it is an example of one of the ways that we, working together as a Christian community, are providing others with the opportunity to begin to grow in their relationship with God through Jesus. I also want to highlight it this morning because it was just this week that some of the abundance of the fruits of our work was revealed. This past Wednesday night, in the parish hall we hosted “Messy Church.” and Messy Church is a monthly service intended and aimed at providing a relaxed, meaningful and family friendly way for folks to experience the teachings of Jesus and taste the kind of community and relationships that God invites us into. This past week, thirty eight people, made up of mainly parents and young children and including The Rev’d Nancy Rowe and her team of volunteers, were guided and supported at Messy Church through crafts, some music and a reflection on the importance of Jesus. At Messy Church prayed, had some fellowship and we ate a meal. This months’ attendance, along with last months total of 34 people both guests and hosts, for me were proof that our efforts to connect new families are beginning to bear good fruit. And I need you to know that the growth that’s beginning to take hold at Messy Church is directly related to the dedicated ministry that Nancy is helping us to provide to the family’s that come to us for Baptism. With her leadership preparing the families for baptism and her shepherding them with the monthly “First Steps” program, her monthly phone calls, and her letters, Nancy has been tilling the soil of relationship with these young families. Her important ministry says to these families that we as a church community care about them and their children’s and family’s spiritual growth. I rejoice today in Nancy’s ministry and ministry of her volunteers that support her Messy Church gatherings, and I say thanks to everyone of you who supports our ministry here at St. George’s that allows us to reach out to these young families and invite them into a fuller relationship with God and with us. If you would like to be part of this growing area of our ministry then I would encourage you to attend to help us welcome and connect with these new families. I would also encourage you to invite others to our Messy Church gatherings who you think might find this sort of gathering a good step toward strengthening their relationship with God. What God’s children accomplished with the temple was truly awesome. But with the New Covenant, Jesus was inviting them, and us to take it to the next step. The definition of being the church, being a community of Christians, being Anglicans, being St. George’s, being a Christian, is determined by the strength of our relationship both with God and with each other. These bonds of relationship form, they hold strong, or they break based on how we treat each other and act with each other. Jesus knew that they day was coming when the stones of the great temple, which had become the central focus of the Jewish Faith, would be torn apart, but he knew he was offering a way build a community in a way that could not be destroyed or torn down by any outside force. The New Covenant was the bond between us and God that he came to strengthen and repair, and the bond between God’s children that he came to build up. These relationships are the building blocks if the Kingdom he proclaimed and promised. These relationships build the ultimate and final structure which we glimpse in our lives when we get it right, like we do when we get it right here on a Sunday, or like we did at Messy church on Wednesday, or this week maybe you saw a glimpse of it at work, or even in you home with your family, or when you were out with a friend. With every baptism and every new relationship, the Kingdom grows. With every act of compassion, with every opportunity we have to demonstrate to another person a Christian virtue, the kingdom grows. So may God continue to strengthen us as we encourage and support each other in this mission Jesus leads us in. Amen.